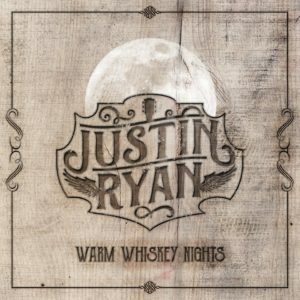 Justin Ryan, a folk-country musician from Maryland has released his debut solo record Warm Whiskey Nights, a beautiful album that shows Ryan’s confidence in his songwriting and musical abilities. Picking up the guitar at the age of 12, he devoured every album that he could get his hands on, giving his current music plenty of influences to pull from, while retaining a clear a path. Opening with “Do A Little Dancin’,” Ryan opens his debut with a mid-tempo rock track that introduces his audience to a southern vibe, while showing off his love of pop records which flows through the entire recording. Tracks such as “Never Let You Down” are acoustic gems that go back to the days when Ryan was front man of the acoustic group All Together Spent who he would tour with up and down the East Coast of the United States for five years, before the group were presented with the unique opportunity to perform on the Armed Forces Entertainment tour. With a beautiful melody, “Never Let You Down” gives listeners a chance to experience Ryan’s indelible guitar hooks and riffs, which become an important aspect of his style as the record progresses. “Through My Eyes,” has Ryan turning towards soft rock on this sultry ballad, while still playing hints of country. While playing a quieter track suits Ryan well, we would like him to turn things up a bit, even if he does employ a spotty electric guitar on this song. A great track to be featured on country radio, it tells a good story, a quality that country fans will fall for. Warm Whiskey Nights ends with “Love Me When I’m Rainin’” a six-minute song that feels like an appropriate number to end the record with. The only thing that could use some work is the choice of tempo. With plenty of slow songs making up Warm Whiskey Nights, this time signature ends up sounding a bit bland as it closes out the LP. While Warm Whiskey Nights has some great selections on it, there are a few small things Ryan needs to work on, though he is on a great path to sharing his music with whoever listens. Listen to the title track “Warm Whiskey Nights” below.